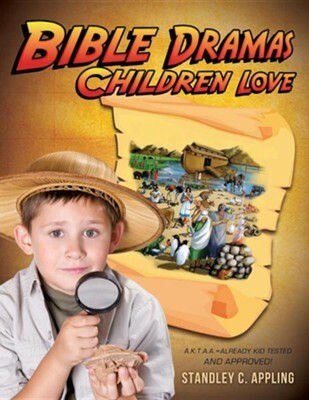 "Bible Dramas Children Love" is just that These plays have already been acted out by youth and a few adults in front of thousands of children A.K.T.A.A. means 'Already Kid Tested and Approved ' These drama plays have been acted out over years of ministry and some of them have even been easily adapted in foreign missionary work in other countries and languages The children loved these plays You will find in these pages a refreshing reverence for God's Word A scientist and his family in Africa find evidence for Creation, and use their archeology skills to find evidence of the flood of Noah. Then children learn valuable life lessons straight from the great heroes of the Old and New Testament with the dramatic conclusion of God's Mighty Angels Children these days need true heroes, and God's Word is full of them You have in your hands an essential tool of children's ministry Ideas are given concerning getting your ministry team together, getting an audience, props and scene preparation, and how others got through a few tough spots in acting these plays out. Questions are given to further explain God's word and lead children to Christ. The use of a narrator carries these drama plays as a way of teaching the Holy Bible to many children especially 5-14 years of age. This is the life work of author and youth pastor Stan Appling, who for over twenty years has been working at a summer program for children, and also in mission work. His wife Marina also writes and helps with keeping the mission going, as well as with their young son. I'm the author/artist and I want to review Bible Dramas Children Love.